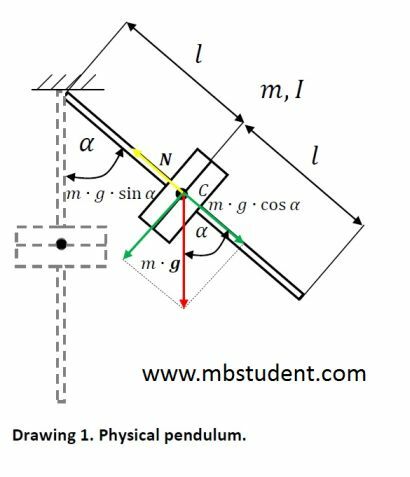 Physical pendulum is built with rigid body. One of rigid body ends is fixed to the ceiling. Rigid body is able to rotate around axis which is placed exactly in place where rigid’s end is fixed. Rotation axis is perpendicular to the plane of drawing. Rigid body has mass m and inertia I. Rigid body length is 2∙l. Note that inertia I is known for axis of rotations. 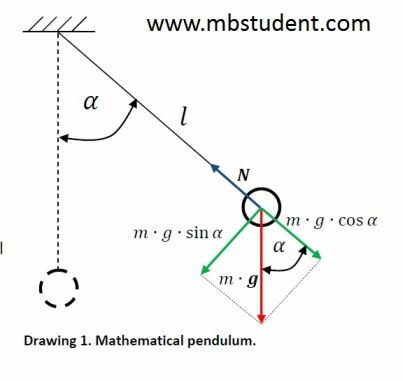 If physical pendulum is in equilibrium position then it is not moving. In equilibrium position gravity force is balanced by rigid body’s reaction force. 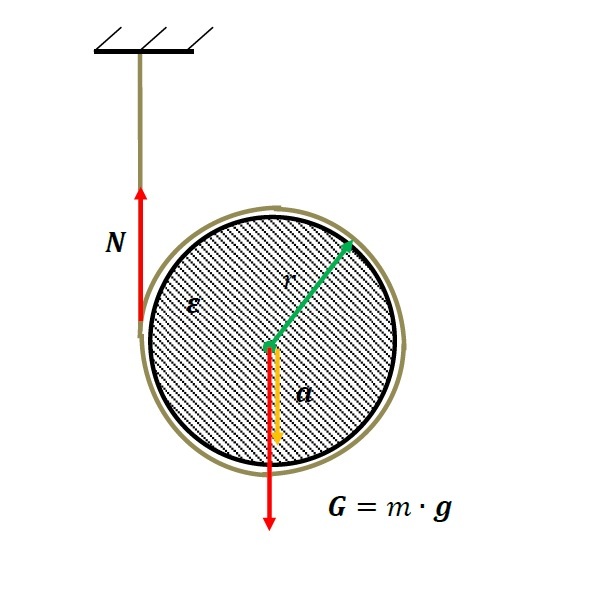 In a certain moment pendulum was deflected from its equilibrium and was inclined from vertical position by angle α. Pendulum is under gravity field, so gravity force works on it. Remember that physical pendulum is rigid body so gravity force is placed on rigid body’s gravity center C.
Mathematical pendulum is built with massless rope with length l. One of rope’s ends is fixed to the ceiling. To the second end of rope is fixed to the material point with mass m. Material point is then hanged to the rope. When mathematical pendulum is in equilibrium material point is not moving. In equilibrium position gravity force is balanced by rope’s tension force. In a certain moment mathematical pendulum was deflected from its equilibrium and was inclined from vertical position by angle α. Mathematical pendulum is under gravity field, so gravity force works on it. 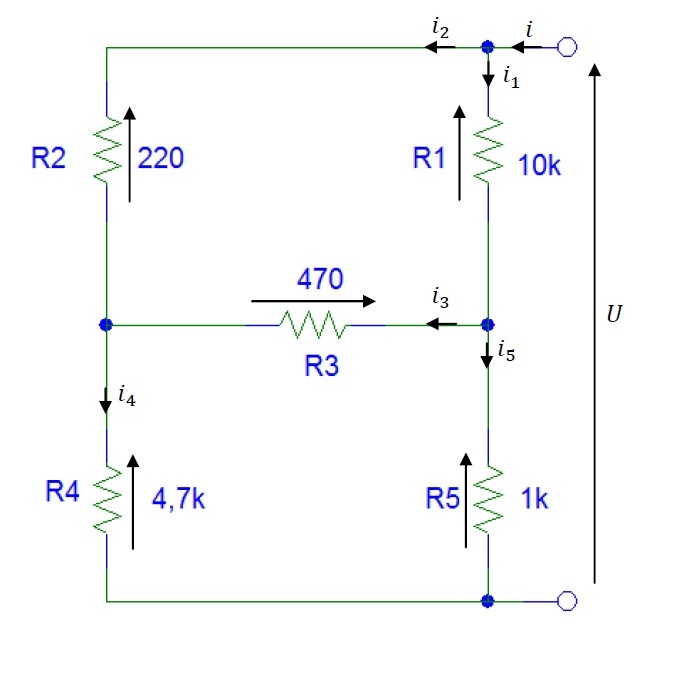 Electrical circuit is built in specific way because resistors are connected in the shape similar to the letter H. They look like H brigde. It’s possible to download simulation in pspice and calculation in Excel to examine circuit’s behaviour. 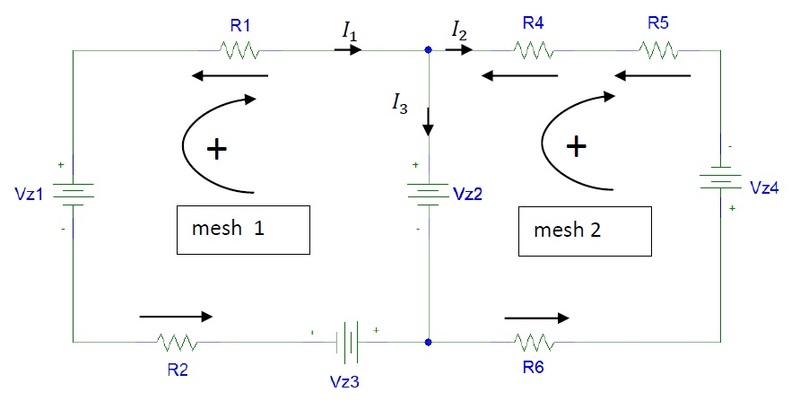 In control theory and automation engineering dynamic models of system which are often created. It is a lot of cheaper and faster to simulate something than prepare real experiment. To simulate an object behaviour the state space representation is applied. State space representation allows to examine object features when it is under influence of various extortions. Set of examples about mentioned method are placed below. Dynamics is a field of mechanics in which causes of motion and working forces are examined. Plenty of examples from mechanics dynamics are on link below.